The 13th annual Father’s Day car and motorcycle show gets bigger every year. 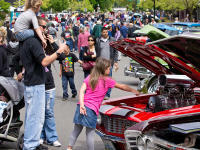 Bring dad out to Burien to see some beautifully restored classic cars, hot rods and choppers at this fun-filled event. Besides the cars and bikes, you can also expect some raffles, classic rock, and a chili cook-off. This Father’s Day, dads accompanied by children get free admission to the Museum of Flight. Check out the Personal Courage Wing to see planes from the Allied and Axis powers of WWII. Is your dad a current or former Boeing employee? You have to see the Museum of Flight’s “Above & Beyond” exhibit, celebrating 100 years of Boeing innovation in the field of aviation. If your dad’s looking for a more laid back Father’s Day, brunch at Basil’s Kitchen is the perfect place to start. For under $30, treat your dad to the delicious brunch buffet featuring carving and omelet stations, bottomless mimosas, and a delectable assortment of desserts. Change up your Father’s Day routine with a few rounds of bowling! ACME Bowl is offering one free game for every round purchased for dads. This deal lasts from 11:00am-6:00pm, so it’ll be a perfect activity between meals. Not on Father’s Day itself, but on Saturday (6/18) the Des Moines Waterfront Farmers Market offers fresh fruits and vegetables, artisan crafts, and live music! Take your dad out to the beautiful Des Moines Marina to enjoy the sights and sounds of the season, and pick up some fresh produce while you’re at it.